Last week, Capital New York revealed that Wikipedia edits made to a number of entries on police brutality traced back to 1 Police Plaza, the headquarters of the NYPD. Among the entries edited were those for Eric Garner, Amadou Diallo, and Sean Bell—all unarmed black men killed by police in New York—as well as the entry for the city’s unconstitutional stop-and-frisk program. The two officers involved will face minimal punishment for using NYPD computers for “personal activity.” While some may see this as a lesson on the credibility of Wikipedia, I argue that it’s simply a more blatant illustration of the racial biases that suffuse narratives of police brutality across all media. All of the edits were intended to minimize or erase traces of police brutality and misconduct from the entries in question. 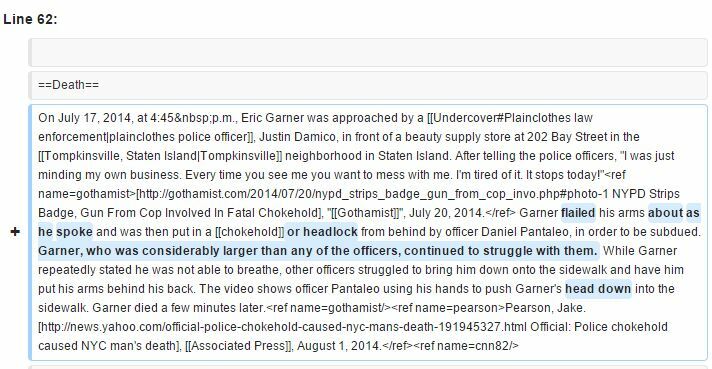 For instance, in the Eric Garner entry, the phrase “chokehold” was replaced by “headlock” and an extra phrase was added claiming that Garner was “significantly larger” than the officers involved. Elsewhere, an NYPD user suggested the entry on Sean Bell, an unarmed black man killed by NYPD officers, for deletion, writing: “He was in the news for about two months, and now no one except Al Sharpton cares anymore. The police shoot people every day, and times with a lot more than 50 bullets.” There were also other unrelated edits to the entries for the band Chumbawumba, croissant, and Sailor Moon. When an external relationship undermines, or could reasonably be said to undermine, your role as a Wikipedian, you have a conflict of interest. This is often expressed as: when advancing outside interests is more important to an editor than advancing the aims of Wikipedia, that editor stands in a conflict of interest. There is little question that the NYPD employees editing Wikipedia were experiencing a conflict of interest when editing entries on police brutality and NYPD conduct. Based on the limited editing history, the officers involved were not active “Wikipedians,” but were rather attempting to “bluewash” the narratives of police brutality on Wikipedia, reframing the narrative of these events in a manner more favorable to the NYPD. First, as many have noted, the tendency to cast black men as violent thugs, dangerous to police due to their size and aggression, reveals racial biases that lead to a staggeringly high instance of lethal force used against suspects of color. Take for instance Ferguson officer Darren Wilson’s testimony on the shooting of unarmed teen Michael Brown: “When I grabbed him the only way I can describe it is I felt like a 5-year-old holding onto Hulk Hogan.” As Jamelle Brouie writes, “Wilson describes the ‘black brute,’ a stock figure of white supremacist rhetoric in the lynching era of the late 19th and early 20th centuries.” Unfortunately, as the recent spate of police brutality and its attending discourse has revealed, the figure of the “black brute” is still alive and well in the media. In the Eric Garner entry, the altered lines about Garner’s physical stature and his behavior at the time of his arrest (“waving his hands in the air”) all point to this same characterization, which in turn supports the NYPD’s assertion that the violent chokehold that killed Garner was a justified use of force. These edits do nothing to enhance the accuracy of the entry, but rather work to support the NYPD’s narrative. In instances such as these, physical size or a less-than-complacent temperament are seen as violent or dangerous in and of themselves. Second, the edits show a clear attempt to sanitize the discourse of violence in an attempt to justify the NYPD’s actions and programs. For instance, the erasure of the phrase “chokehold” (the illegal maneuver that killed Eric Garner) in favor of the more neutral phrase “headlock” removes not just a phrase from the narrative, but a central question in the debate about Garner’s death. While the officer involved claimed that the maneuver used was not a chokehold, the medical examiner who ruled Garner’s death a homicide noted that Garner was killed by “compression of neck (chokehold), compression of chest and prone positioning during physical restraint by police.” The removal of the phrase changes the terms of the conversation, and erases a significant debate in the subsequent discourse surrounding Garner’s death. In turn, it takes the focus off of physical trauma and violence wrought by white officers upon bodies of color. Another notable facet of this controversy is its location: the crowd-sourced encyclopedia Wikipedia. On some level, it may not be surprising that the NYPD edits Wikipedia entries pertaining to their actions—after all, Congress and the UK government employees have been caught in the act before. Indeed, college instructors malign Wikipedia as inaccurate and take points off of student assignments when Wikipedia is cited. While as instructors we may frown upon our students citing a crowdsourced body of knowledge, the fact remains that Wikipedia is a commonly-used source of information, and often a valid source for basic information as long as one is willing to engage in some basic fact-checking. As danah boyd, a prominent internet researcher, writes, while Wikipedia is not a proper encyclopedia, it can be a very effective resource for students when combined with effective media literacy education. Yet, what is most troubling about the NYPD’s edits is that they demonstrate a much more insidious bias that is omnipresent even in so-called mainstream media—those outlets employing professional journalists and fact-checkers who abide by strict codes of ethics. While the officers’ edits may have been made consciously in order to swing the narratives more favorably towards the NYPD, the fact remains that even mainstream news outlets often cast young men of color as criminals and addicts, police brutality as justified, and protests as needless anger. The NYPD’s Wikipedia edits were merely a more blatant manifestation of the bias and strategic reframing that suffuses discourse about race in the United States. On March 12, 2015, Dr. Sara McKinnon and I hosted the second in what we imagine to be an ongoing series of community debates regarding incarceration and law enforcement in Dane County. Over 300 people attended the debate, which considered the following proposition: Renovations to the Dane County Jail will ensure the safety of vulnerable people in our community. The debate featured County Sheriff David Mahoney and local physician and retired professor, Dr. Douglas Kramer on the affirmative side and M. Adams of Freedom Inc., and the Young Gifted and Black Coalition along with Nino Rodriguez of the MOSES Jail Taskforce on the negative. You can watch it here. There were many reasons for hosting this debate on this topic, but primarily we wanted to create a forum to consider the different sides of an ongoing discussion at the county level about whether to renovate the county jail due to what the Sheriff says are grave safety concerns (originally the conversation was about whether to build a brand new jail, though after months of local agitation, that proposal was taken off the table). Members of the communities most impacted by incarceration and policing and their allies have loudly spoken against these proposals, demanding the county build the people, not the jail. For some in these latter communities, it is hard to imagine how Dane County, known simultaneously as a progressive bastion and home to the worst racial disparities between blacks and whites in the United States, can even consider pouring money into the jail. In 2013, the Wisconsin Council on Children and Families’ Race to Equity Project Report detailed the severity of racial disparities here. Some of the most startling statistics included that 75% of the county’s black children live in poverty, compared to 5% of white children. This is relevant to the jail conversation because many people spend time in jail due to committing crimes related to being impoverished (e.g., theft, drugs, public urination). In 2013, Madison Police Department arrested black people at a rate of 11-1. And countywide, black youth are 15 times more likely to be placed in juvenile detention than their white counterparts. Perhaps one of the most disturbing facts about racial disparities in Dane County pertains to the county jail itself. While Dane County’s black population is about 6-7%, the Dane County Jail black population is around 48%. The practice of academic debate has received a lot of attention from rhetoric and argumentation scholars. Some of those scholars, perhaps most notably Gordon Mitchell and those who write about urban debate leagues, have focused on the activist and public importance of academic debate. We have little to no scholarship that addresses the use of debate outside of the academic context. A few articles and conference papers have focused on Malcolm X’s use of debate to confront his adversaries and promote and defend his positions, including the work of Robert Branham. Branham explains that for Malcolm, debate was “a unique and valuable form of public address. His use of debate was a deliberate rhetorical choice, through which he believed that his positions might be advanced most persuasively to the largest possible audience (Branham, 1995). He confronted highly educated and sometimes nationally recognized adversaries in a format that accorded him relatively equal standing and some assurance that his views would receive consideration and response.” This view of Malcolm X is consistent with how McKinnon and I imagine this format in the local community. Each debate will feature a black radical position against a more moderate liberal or progressive position, and the issues addressed will be centered on black experience and voices. The point is to show the nuance of left-leaning politics on issues that are of vital importance to local black communities and to give a legitimizing space to radical black voices. The point is also to show how spaces where activism and deliberation converge do not have to be governed by norms of whiteness and civility. Instead, productive and engaged political spaces can be open to a variety of displays of affect and involvement. To us, this seems like not only a great way to advance the “Wisconsin Idea” in a time when it is under attack, but also a way to show the significance of rhetoric and public address to contemporary political culture on our most pressing community issues. You can watch the first debate here. The proposition was: Police body cameras are an important part of the solution to the problem of police violence. Stay tuned for more. Branham, Robert James. “`I was gone on debating’: Malcolm X’s prison debates and public confrontations.” Argumentation & Advocacy, 31, no. 3 (1995): 117-137. Mitchell, Gordon R. “Pedagogical possibilities for argumentative agency in academic debate.” Argumentation & Advocacy, 35, no. 2 (1998): 41-60. Madison, WI, progressive bastion of the Midwest (or so its residents like to think) saw itself become the next city to kill a black, unarmed teenager post-Ferguson last Friday night (March 6). 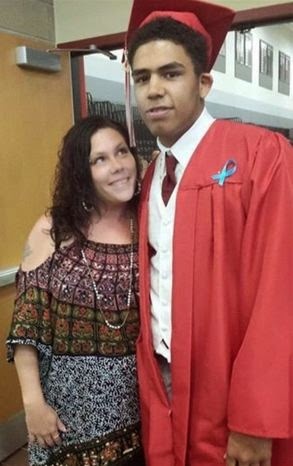 The teen, Tony Robinson, was shot five times by a police officer in a house on “Willy Street” on Madison’s East Side. In the days following, protests have grown in size, and with them, media coverage has grown in frequency and scope. As a white Madison resident concerned with the city’s disproportionate arrest of black men (they’re 8 times more likely to be arrested than white men here), and the spatial and economic segregation of the community, I have so many thoughts and so very many feelings. As a scholar, I am overwhelmed by all there is to see and hear. Speeches. Gestures. Blog posts. Newspaper articles. Videos. Still images. Some coalitional. Some divisive. Some purporting to be descriptive. Some honest about offering interpretation. All rhetorical. Madison’s police chief demonstrated the Platonic tradition of denigrating rhetoric even as he employed it to apologize to the community. In a March 9 “Message to the Community” blog post, Chief Koval points to Sir Robert Peel, the “founder of modern policing,” to explain that “POLICE ARE THE PUBLIC AND THE PUBLIC ARE THE POLICE” (Koval’s emphasis). He then employs a number of metaphors: putting on “armor” each day, thinking about the police as “guardians” of “the vulnerable, the voiceless, the victims.” Then, as he concludes, he writes, “Let us continue to demonstrate to you that our commitment transcends mere rhetoric” (emphasis mine). Image source: The Isthmus, a Madison, WI newspaper. 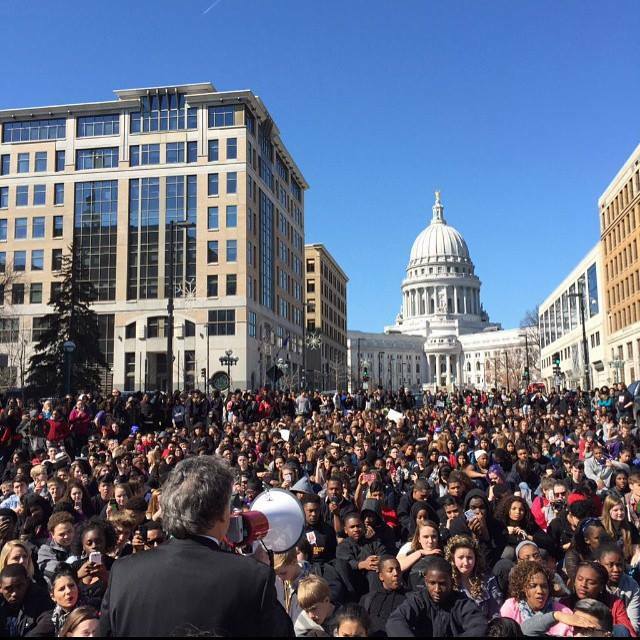 Scholars of traditional public address often hear that their work matters little in a digital world, but the above image of Madison Mayor Paul Soglin addressing more than 1,500 young protestors on Martin Luther King Jr. Boulevard suggests otherwise. As the street name reminds us of one of the great orators of last century’s civil rights movements, Soglin’s bullhorn before this group of protestors demonstrates the continued expectation that political leaders speak in times of social and/or political upheaval. “Indict. Convict. Send those killer cops to jail. The whole damn system is guilty as hell.” “Hands Up, Don’t Shoot!” – As the crowd marched across the city, these collective chants demonstrated a belief that shared words and shared experience (the aural, the embodied, and the visual) were important to communicate their response to the deaths of unarmed black youth and adults in Madison, and beyond. Of all the chants that I’ve heard at this week’s protests, my favorite one is this: “This is what democracy looks like! This is what democracy looks like!” From a community grappling with principles of fairness, equality, and justice this week, I offer these examples to illustrate the critical role rhetoric plays in these negotiations. As rhetorical scholars, we are trained to notice, think through, and make sense of these symbolic representations. However, as I hope the above illustrates, and as this blog hopes to communicate, everyone is always both a rhetor and a rhetorician.